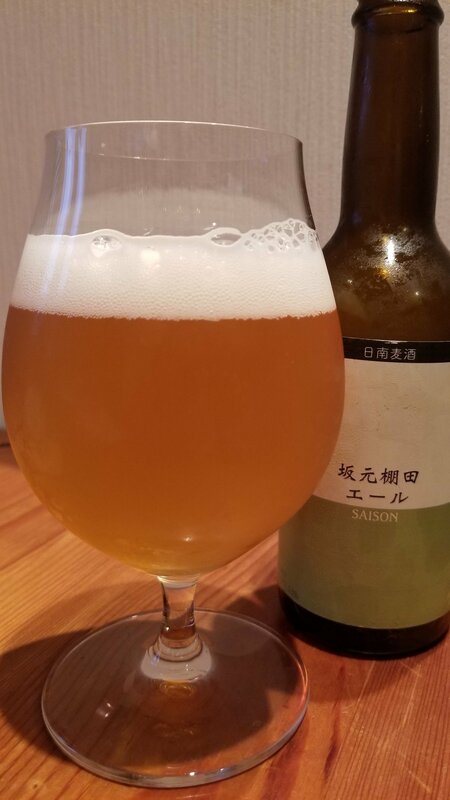 Nichinan Sakamoto Taneda Ale is a 6% saison by Nichinan Brewery, based in Miyazaki, Japan. It’s part of the regular lineup and can be found in both bottles and on tap though in limited supply. Nichinan Sakamoto Taneda Ale is brewed using imported Canadian malts as well as rice from the sakamoto taneda (sakamoto rice terrace) which was voted one of Japan’s best rice terraces – people really will vote for the best of anything it seems? Nichinan Sakamoto Taneda Ale poured out a hazy golden straw colour with a plump white head on top. There was a distinctly funky fruity aroma coming off it. The phenolic aromas were a tad strong with this beer perhaps needing some resting time, or even less stress on the yeast during brewing. I have to say, Nichinan Sakamoto Taneda Ale was incredibly fresh, with it having been bottled only a week before drinking, so this may have contributed to the potent aroma. Nichinan Sakamoto Taneda Ale also had some sour notes to it which seemed deliberate as they were not face-curling sour but more a twang. Nichinan Sakamoto Taneda Ale should come with a dry warning on it. Talk about sucking the moisture out of my mouth as I drank. Not a bad thing as there was alcohol to replace the moisture. The fruity phenolic flavours were stronger than the sweet malty flavours. In the end, Nichinan Sakamoto Taneda Ale left a fruity sour aftertaste that could perhaps be described as refreshing. The flavours could do with some reigning in, but Nichinan Sakamoto Taneda Ale is a decent try that needs to be aged.